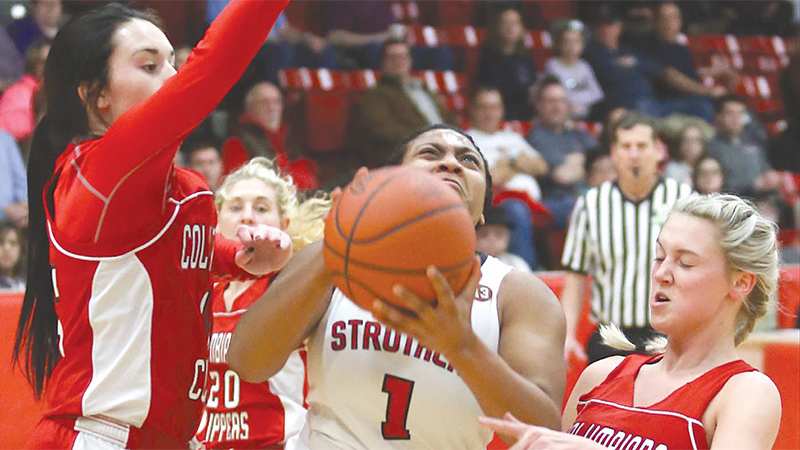 Struthers guard Khaylah Brown had a pretty good idea what it was going to take for the Wildcats to topple visiting Columbiana. Brown shared that information with teammate Alexis Bury and looked like a prophet in doing so after a 61-52 victory on Monday night. Brown (3 of 4), Bury (2 of 2) and Keasia Chism (2 of 2) combined to make seven of eight free-throw attempts over the final 1:13 to curtail the Clippers’ attempt at a comeback. It was a layup from Brown that helped the Wildcats right the ship. Michelle Buser’s 3-pointer gave Struthers (18-3) a 35-26 advantage with 3:41 to play in the third period and touched off a 16-2 run that put the Wildcats in front, 48-28, with just under six minutes remaining. That shot opened up the lane for Bury, who scored twice on drives to the bucket, and allowed for the guards to get the ball in to the post. Marisa McDonough’s two free throws shocked the Clippers (20-2) into action. Kayla Muslovski netted 11 points as Columbiana closed to within six, 52-46, with 1:34 to go. The first half began much the same way the final four minutes of the third period played out. The Wildcats used five points from Brown and four more from Chism to claim an 11-0 lead less than three minutes into the game. Struthers held that 11-point edge, 20-9, to start the second quarter and pushed the lead to 24-9 following a layup from Renee Leonard. Alexis Cross answered with her own layup for Columbiana to start a 13-1 run in which Muslovski netted eight points, including a 3-pointer, and Grace Hammond knocked down her own triple as the Clippers closed to within three, 25-22, with 1:11 remaining in the half. Struthers led, 27-24, at the break. Muslovski led everyone with 29 points and seven steals and Cross finished with 13. Brown paced the Wildcats with 20 points and six steals, Chism had 12 points and Bury (eight rebounds, two assists) and Trinity McDowell (12 boards) each chipped in with eight points. January 11, 2018 12:08 a.m.
February 14, 2019 12:08 a.m.
January 22, 2017 12:07 a.m.
January 21, 2018 12:07 a.m.